Home	/ Edwire	/ What Can Teachers Do for students who Have More specific Anxiety Needs? What Can Teachers Do for students who Have More specific Anxiety Needs? Some students excel and thrive on challenges related to performance, evaluation and social interaction. Others experience distress under such conditions. Students who experience significant stress at school are at risk of developing anxiety related symptoms. Universal strategies are a good foundation and benefit all students. However, for some students whose anxiety interferes with their daily living, these strategies are necessary; for a few students, specific strategies are required to help them manage their anxiety. Specific strategies are intended to reduce and manage potential sources of anxiety. For a few students, to develop these specific strategies a referral to a mental health professional may be required. You may have taught students who have been diagnosed with an anxiety disorder. Teachers are an essential support for these students; however, teachers cannot do it alone. For these students, the expertise and support provided through school mental health professionals such as school social work and psychology as well as community mental health providers is important. This support may include a medical or psychiatric assessment, medications, intensive therapeutic interventions, and family education. assisting in the development of documentation to support the student in the classroom (e.g. : Individual Education Plan). Although general classroom strategies and more specific strategies may be helpful for students who are diagnosed with anxiety disorders, it is important for teachers and mental health providers to work together with students and parents to determine which interventions should and should not be used. Realistic expectations for managing specific anxiety (test anxiety, social anxiety, obsessions and compulsions, etc.) are critical for students with more problematic anxiety. Educators and students should develop realistic priorities collaboratively, such as providing accommodations for learning, and engaging the appropriate teachers. Setting priorities for well-being and adjustment at school – not just getting the work done – serve to reduce anxiety and promote optimism about the student’s ability to manage the anxiety both in the short term and the long term. Educators and students should develop realistic priorities collaboratively, such as providing accommodations for learning, and engaging the appropriate teachers. Setting priorities for well-being and adjustment at school – not just getting the work done – serve to reduce anxiety and promote optimism about the student’s ability to manage the anxiety both in the short term and the long term. An essential part of intervention and management is being able to identify the specific concerns and to include the student as well as his/her parent/guardian in developing a support plan. Develop a support plan of specific strategies together with the student and begin intervention (include feedback and incentives for effort!). With reassurance, structure and safety, students can begin to use the coping strategies identified in their support plan. Encourage them to take small steps towards their goals. Reinforce their coping strategies (e.g., breathing, visualizing, counting, self-talk, relaxation) and help set them up for success by providing flexibility and adjusting work expectations (e.g., evaluation, small chunks, provide interim deadlines, discourage perfectionism) as needed. Help them be available for learning in the classroom by reducing the anxiety they feel by providing consistency in expectations and routines and by not singling the student out for attention in class. Develop signals with the student to let them know in advance when they may be called upon. Provide them with opportunities to build their confidence and to build on success. By normalizing fears and recognizing that “everyone has concerns and worries,” we lessen the stigma that can be associated with anxiety. Create a classroom environment with “no blame, no shame”. With reassurance, structure and safety, students can begin to use the coping strategies identified in their support plan. Students who are anxious may be socially isolated. It is important to provide them with time to talk, a daily check-in if needed, a safe place for them to take a break, and an established signal that allows them to indicate to you that they are feeling anxious and may require help. 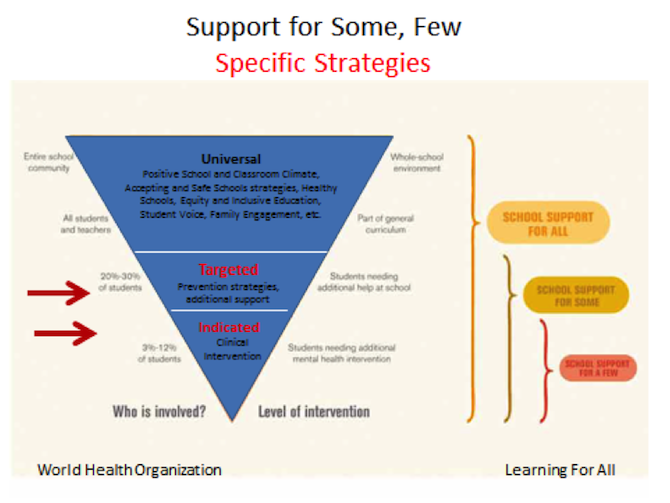 Whenever there are concerns regarding an individual student, it is important to enlist the support of your school’s mental health team for strategies and support. By normalizing fears and recognizing that “everyone has concerns and worries,” we lessen the stigma that can be associated with anxiety. Create a classroom environment with “no blame, no shame”. Just as it is important to develop the support plan with the student, parent(s)/guardian(s) and any mental health professionals involved in providing support for the student, it is important to monitor and evaluate this support plan over time with the student’s feedback. Which strategies are working for the student? Which aren’t working? Are there any other supports that may help or be needed? Is the student managing and coping or is it necessary to now engage with school-based and community supports as appropriate for assessment and further treatment planning. It is essential to continue to communicate with all supports and re-engage school-based Mental Health Professionals if you are concerned. Louise Moreau is an implementation coach with School Mental Health ASSIST, a provincial initiative supported by the Ministry of Education as it has deepened its’ commitment to student mental health and well-being as part of Ontario’s Comprehensive Mental Health and Addictions Strategy. In this role, she provides leadership and coaching support to school boards across the province.